Residents of Siew Trace, Debe, walk through flood waters after being forced to leave their homes. 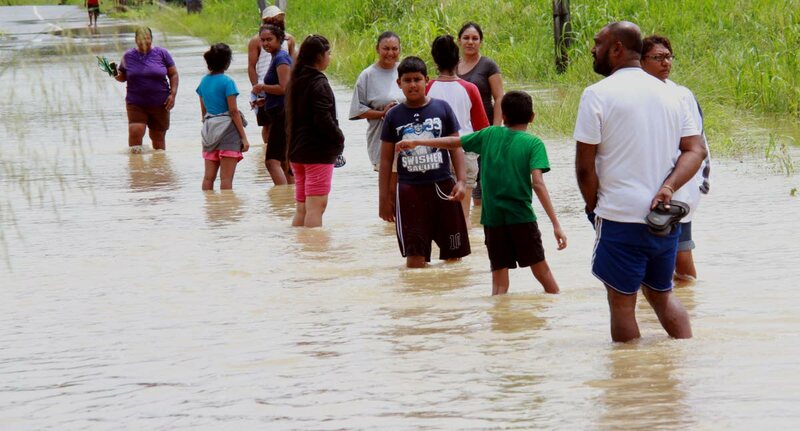 POOR drainage is being blamed for widespread flooding in Debe on Tuesday that cost residents thousands of dollars in damage. When Newsday visited the home of 73-year-old Gully Gokool on Tuesday, relatives were trying gather their matriarch’s belongings which were swept away when the Oropouche River bursts its bank. Gokool, who is partially blind, lives on the ground floor of the house and most of her clothing, appliances and groceries were destroyed by the flood. She had to be carried out of her flooded bedroom by her son Krishna Gokool when floodwater began soaking the mattress on her bed. Krishna said although his mother is not well, she is very strong-willed and she had insisted in staying in her room until they had no choice but to evacuate her. The family’s living room set, clothes and murtis were all spread across their front yard, still soaked from flood waters. The Debe Hindu School was also affected with water reaching up to three feet high on the compound. 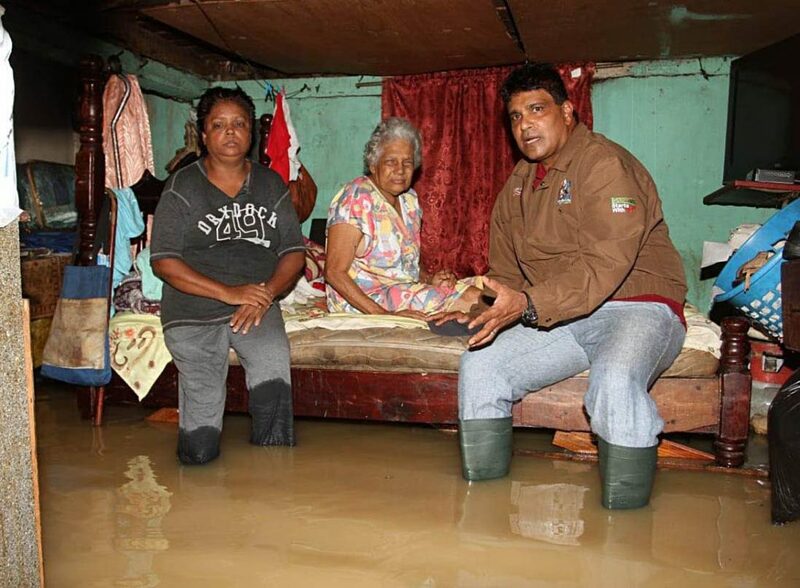 GULLY ASSISTANCE: Oropouche West MP Dr Roodal Moonilal comforts Gully Gokool and a relative, whose house at SS Erin Road, Debe, was flooded on Tuesday trapping the elderly woman in her bedroom. The Penal/Debe Regional Corporation sent in clean-up crews on Wednesday to power-wash and sanitise the school. Pundit Rajesh Tewarie, who was at the school when the flooding started, was preparing props for an upcoming skit. He said the water rose quickly. "Within half an hour, the entire place was flooded out. We were able to put some of the props on higher ground but some of our stuff was damaged." But Tewarie said the flood had not dampened spirits as the 50 children who will perform in the annual production were out in their numbers for rehearsal even as clean-up was underway. A short distance away in Debe Trace, Kim Ramnarine and her family were counting their losses as the flood wreaked havoc on their market produce. The family sells dry goods at the nearby Debe market. Ramnarine said she had gone to see a movie with her husband and in-laws in San Fernando when she got a call that water was rising quickly in front of their home. "Before we could reach home, the water was already three feet high in the yard and under the house." Their refrigerator, washing machine, boxes of salted fish and bags of potato were covered in water when they got home. Her father-in-law, Nathram Ramnarine, 68, said a farmer had dropped off 500 pounds of pumpkin for his sons early Tuesday morning. It was only when flood waters subsided around 2am yesterday that Nathram said he noticed a number of the bags with the pumpkin. "Something needs to be done to fix the drainage system in the area, we can’t be going through this every time rain falls." He is calling on the Ministry of Works and the Penal/Debe Regional Corporation to make a proper assessment of the drainage system and do the necessary work to prevent further flooding. Reply to "Debe residents counting flood losses"